Questions on the game "Combat"
In what the essence of game? The team's headquarter staff receives tasks on the web-site, and participants carry out fascinating missions in the real world. The purpose of each mission - to find a code. It can be written in a cellar of the old building, under a bench in park, on the top of a water tower in village or on the agent's forehead in a night club. In a word, the code can be written and hidden anywhere! As a rule, coverage of the game is - all city. If there are levels in some other areas players will be informed in advance. Also approximate milage can be specified. What is the order of the game passage? 5) if the code is accepted, the coordinator receives the task to a following level. During the game its not necessarily that coordinator should be at home behind the computer or in the Internet-caffe. He can be any player from a field crew, receive tasks on his lap-top or simply mobile phone (each domain has wap http://britain.en.cx/wap version, so it is possible to play using mobile phone). Mainly at the night from Saturday to Sunday. Thats the time when the city is free of traffic and ready to accept in the bosom of adventurers in its city. However, there are also single foot games which can be held in the afternoon on Saturday or Sunday. The average game lasts 5-10 hours. Some games settle up for several days, If so, it is informed in the announcement to the game in advance. The team finished all mission in shortest time wins. Adjustments of final game score are brought in view of all bonuses and penalties, which teams have received during the game . Who is the author of the game's idea? 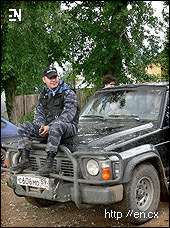 The "Combat" game was introduced by Ivan Masljukov (im ) in 2001. The first game by modern rules took place in Minsk, capital of Byelorussia, on October, 7th, 2001. Yes, there is. Refers to " Encounter. Night extreme " .